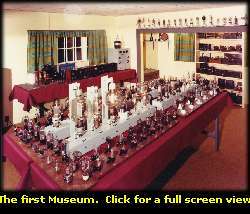 The Hammond Museum of Radio got its start when museum founder Fred Hammond began collecting early radio and wireless artefacts at the age of 16. The first public display of his collection was in a small building at the rear of his College Street home that originally housed his ham station. This photo was taken about 1960. 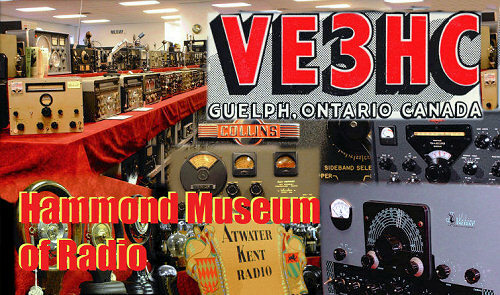 When in the early '70s, Hammond Manufacturing Company built a new plant on Guelph's Curtis Road, Fred made sure a 4,000 square foot area was reserved to house the 'Hammond Museum of Radio'. 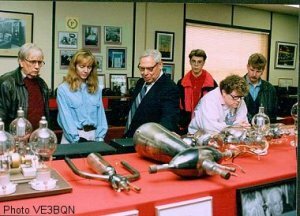 Shortly before Fred's passing in 1999, a complete new and larger facility at the Hammond Power Solutions new expansion became the current home for the Museum. The new Museum is now home to hundreds of receivers and transmitters dating from the spark era up to and including National's first solid state HRO500. Over the years the Museum has evolved to become one of North America's premiere wireless museums. The above photo was taken during a tour of the Curtis Road Museum when Bob Scott now VE3WW, Sandie Hardie (formerly VE3EHS). The young boy is Colin VE3UED son of Brian Clark VE3ULQ. It was with deep sadness that on November 7th, 1999 we learned of the passing of museum founder Fred Hammond VE3HC. You can read more about this great pioneer here. To arrange for a tour, or for more information, please click here.